The Face Shop's Myeonghan Miindo Heaven Grade Ginseng range has launched in Singapore, and as the name suggests, the range contains "Korean herbal extract" and "heaven grade ginseng", and is supposed to draw on traditional Korean knowledge to help improve the skin's condition. The Face Shop's English site claims that there are "brightening ingredients in white ginseng extract help to improve dull skin and brighten your skin tone", and also that it uses "traditional herbs grown in Korea". So I guess for all the Korea-philes (what with the popularity of K-pop and K-drama nowadays), this would be pretty intriguing! The Face Shop Myeonghan Miindo Heaven Grade Ginseng Whitening Emulsion: With "Korean herbal extract"
The product I got from the range was The Face Shop Myeonghan Miindo Heaven Grade Ginseng Whitening Emulsion, which, again as the name suggests, is an emulsion - a light moisturizer - with whitening properties that also contains the heaven grade ginseng. Interestingly, Myeonghan Miindo supposedly means "land of the beauties", which I guess adds to the traditional feel of the product, along with the very classical-looking bottle. The price range for the Myeonghan Miindo range varies from $12.90 for the sheet mask to $75.90 for the eye cream or moisture cream, so depending on what you buy, the impact on your wallet can vary quite a lot! 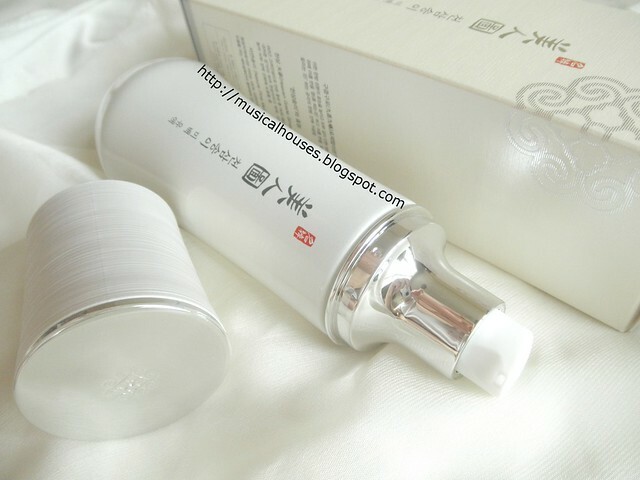 This particular product, the Whitening Emulsion, costs $46.90. Of course, for this review, we're also going to take a look at whether the Myeonghan Miindo Heaven Grade Ginseng Whitening Emulsion really lives up to its claims of whitening. And to do that, we'll start right at the ingredients list! The main ingredients in the Myeonghan Miindo Heaven Grade Ginseng Whitening Emulsion are water, humectants (Propanediol, Butylene Glycol, Glycerin, Methyl Gluceth-20), some of which also function as penetration enhancers, silicones (Cyclopentasiloxane), emollients (Octyldodecyl Myristate, Hydrogenated Polyisobutene). 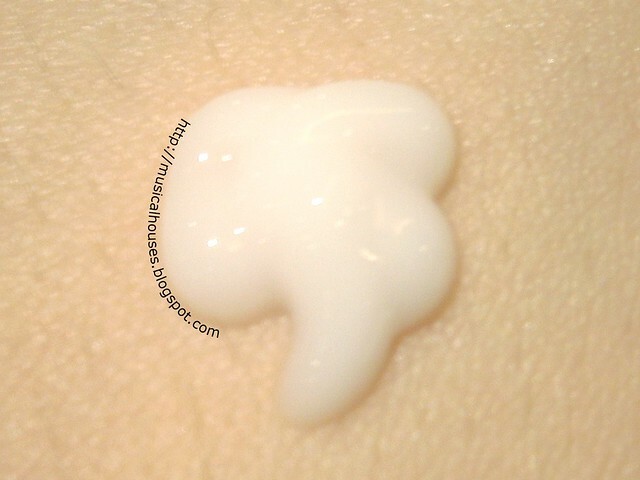 In addition, There are also a couple of skincare ingredients that make up the "actives" of the product, such as Niacinamide, which is usually found in anti-aging products due to its ability to enhance the skin barrier and improve elasticity, but is also found in whitening products, as it can also help to improve uneven skintone. There is also Portulaca Oleracea Extract, which is usually used in skincare as an anti-inflammatory ingredient or an emollient, but more recently has been explored as a whitening and anti-ageing ingredient as well. It's likely that the main whitening skincare benefit in the product comes from the Niacinamid, and possibly, the Portulaca Oleracea Extract. After most of these ingredients, comes 1,2-Hexanediol, a solvent that also has humectant properties and is sometimes used as a preservative. 1,2-Hexandiol is typically found in concentrations ranging up to 10% in skincare products and cosmetics, thus, we can make an educated guess that the ingredients after 1,2-Hexandiol are likely to be in concentrations of less than 10%. This would include the 11 plant extracts found here, including Panax Ginseng Root Extract, which is the "heaven grade ginseng" headlining the product. The effects of these extracts vary, and there is also similarly varying published evidence for how effective they are - the good ones have a few interesting papers written, and the not-so-great ones have barely any evidence. Some could have anti-oxidant or anti-inflammatory effects (Tricholoma Matsutake Extract, Panax Ginseng Root Extract, Lycium Chinense Fruit Extract) some function as emollients or skin conditioners (Polygonatum Multiflorum Rhizome/Root Extract, Artemisia Princeps Leaf Extract, Achyranthes Fauriei Root Extract), and some are believed to have whitening effects, with varying amounts of science to back that belief up (Tricholoma Matsutake Extract, Poria Cocos Sclerotium Extract, Cuscuta Japonica Seed Extract). The interesting thing, though, behind the choice of plant extracts is not so much their function - after all, a plant extract that serves as an emollient or an anti-oxidant isn't all that rare - but the fact that a lot of these plants chose are those which have been used in traditional Chinese, Japanese, or Korean herbal preparations and traditional medicines. Angelica Gigas, Panax Ginseng, Tricholoma Matsutake, Lycium Chinense are plants that have been used in Korean, Japanese or Chinese food and medicinal preparation, although interestingly Cuscuta Japonica also happens to be considered a weed in parts of the US, namely Texas and California. (On a side note, it was apparently originally brought to the US from Asia as medicine. I guess one man's meat is another man's poison, huh?) Also, Macadamia Ternifolia Seed Oil is as "Western" as plant-based extracts and oils can get. But on the whole, most of the plant extracts are derived from plants that are native to Asia, some of which have been used in traditional food and medicinal preparation. I guess all those used-in-traditional-Asian-foods-and-medicine plants are there to back up the claim that the Myeonghan Miindo Heaven Grade Ginseng Whitening Emulsion (and the Myeonghan Miindo range as a whole) does live up to its claim of drawing on traditional plant extracts too. While there isn't anything special when it comes to Asian plant extracts (as opposed to plant extracts from plants in other geographies), since they can all serve varyingly as anti-inflammatories, emollients, anti-oxidants and the like, I imagine that the slew of extracts would nevertheless appeal to those who love all things Asian, or who want try a skincare product that incorporates some more Asian plant extracts. It's always good to have some sort of unique selling point in a tough market, I guess! So, if we were to look at the formulation, we can see that the The Face Shop Myeonghan Miindo Heaven Grade Ginseng Whitening Emulsion is formulated primarily as a light moisturizer with humectants and emollients, with some plant extracts too. Now that we're all done with the ingredients science and geekery part, let's talk about the product. 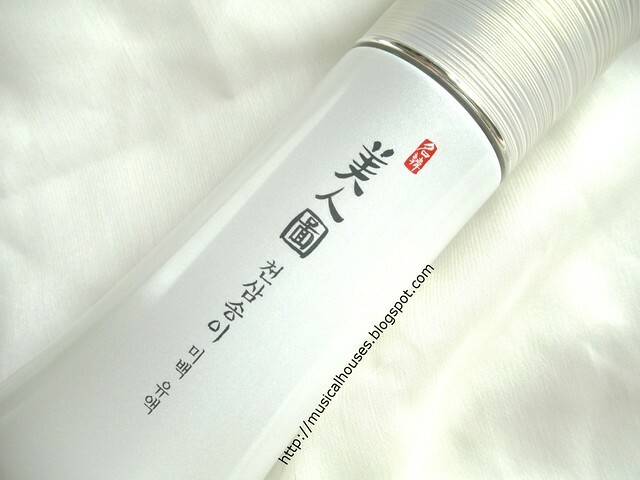 The Myeonghan Miindo Whitening Emulsion is a light, white opaque gel, with a fairly strong floral fragrance that dissipates upon application. The emulsion is also pretty lightweight, and feels a little bit on the watery side. It is light and absorbs well without leaving any residue. When I used it, I felt like it did help to hydrate my skin and leave it looking better overall. As a bonus, it also works pretty well under makeup - the several silicones and polymers in the product act a little like a primer under cosmetic products. I also liked that the Whitening Emulsion came in a pump bottle. Much easier and more hygienic to use than a jar, and also, for some of the antioxidant ingredients (like the plant extracts and so on), a pump bottle helps to prevent them from coming into exposure with air or light, thus keeping them effective for longer. Pump bottles, along with squeeze tubes, are probably my favourite packaging types, so anytime I get a product in one of these packaging types, I feel like I have to make a note of it. That's a lot of products. But is it really necessary to use it all on your face together? I know that lots of people love the ritual of applying a whole set of skincare, but I'll be frank - from the perspective of a skincare geek and ingredients analysis enthusiast, it really doesn't make that much sense if the formulas are fairly similar. As far as I'm concerned, if I have to spend time layering multiple skincare products, then each product should be doing something different for my face. Otherwise, if I'm layering a similarly-formulated emulsion over a similarly-formulated essence over a similarly-formulated lotion, I would be doing extra work (and spending extra money) for no extra skincare benefit. And in the case of the such skincare ranges, the formulas don't differ all that much - or at least, not enough for me to really consider layering all of them together. So although I know lots of people would buy the entire set and use it (especially if you are into the whole "complete skincare regime with traditional Asian herbs" concept), I'll come right out and admit that this isn't for me. I would prefer to pick one or two products from the range, (say a lotion and an emulsion, one for day and one for night), and just incorporate those into my existing skincare regime. But then again skincare routines are as much determined by preference as they are by science, so your preferences might vary. So yes, after a very long review, we have indeed come to the end! 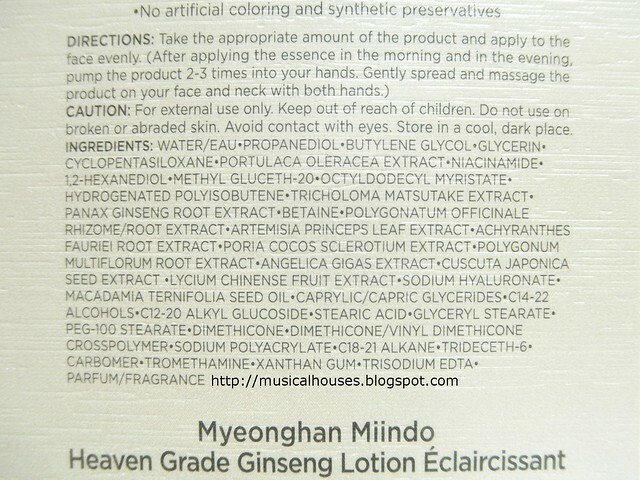 Would I recommend the The Face Shop Myeonghan Miindo Heaven Grade Ginseng Whitening Emulsion? If you're looking for a product that is a good lightweight lotion with hydrating properties, and has some whitening and anti-aging properties, then this is a good product to pick. Also, if you're curious about Asian plant extracts in skincare and want to try a product that features such plant extracts, this also has a bunch of them. Lastly, if you want a moisturizer or lotion that feels light on the skin and absorbs fast without leaving any residue, this may also be of interest to you. For me, this is a good all-around lightweight moisturizer with whitening and other anti-aging properties, and I will be keeping this around in my stash! The Bottom Line: The Face Shop Myeonghan Miindo Heaven Grade Ginseng Whitening Emulsion is a great lightweight moisturizer with Niacinamide for extra whitening and anti-aging benefits. The product sounds good, and I hope Canada's Face Shops have it. I don't think I'd buy the whole entire range either. Thanks for such a thorough review - especially the ingredients analysis! I've gotten into reading the ingredients list because I have sensitive skin and your breakdown was very helpful. I've been incorporating an Innisfree lotion/emulsion and, whilst that's been great on my skin, I am looking to branch out. This one just might be the one! I am using this product for a week now, and as a man I can say it really works! Hi! In terms of whitening/brightening, did it help fade away any dark spots or discoloration or just give you an added glow? Let me know, thanks! ooh, okay! Well, I'm all about that Asian Beauty glow, so I'll add it to my wish list.. that never ends... lol! Thanks for replying! I have really sensitive skin and unfortunately this dried up my skin. I had high hopes for this but then i got disappointed. :(. Maybe i should use it in moderation i really want this to work. :(. It's not a cheap product. :(. Use in moderation, and also use alternative moisturizers. did this product can recover our dark spot from pimple?